Not JUST a Book! - You CAN Go the Distance! In addition to the book, however, I have also created a website, www.YouCanGoTheDistance.com, to be an on-line resource and community for you. On the website, you find the complete text for some chapters and partial text for other chapters in this book. You’ll be able to interact with other readers and me by posting comments or questions in each chapter. There are also how-to and motivational videos, and links to other on-line resources. My goal with the book and the website is to give you the confidence of knowing you are not in this alone. Marathon runners are a very generous and helpful breed of people, so they will be there to support you and answer your questions too! When you get to the last chapter, The Finish Line, be sure to jump over to that section of the website. When you finish your marathon, or any other race or big accomplishment, tell us about it at The Finish Line (http://www.youcangothedistance.com/book/finish-line) so we can cheer for you and give you a virtual High-Five. Also, come see who else has finished their race and be a cheerleader for them. 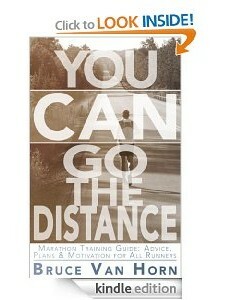 As you read through this book, if you have any questions or want to share a comment, just go to the corresponding chapter at www.YouCanGoTheDistance.com and engage with the community. Also, as a tip for getting the most out of this Kindle version (and for all of your Kindle books), make sure you log into your Kindle account at Amazon.com and be sure to have your “Automatic Book Updates” setting set to “On”. This will ensure that you’ll get the latest version of the book if I can content or make corrections to any of the content. 4 Responses to Not JUST a Book! I’ve written the book with the hope that you will use it “as” reference to look back upon as you move through your training and as a source of inspiration and motivation on those day, which you will have, when you doubt whether or not you can do it. Awesome! It’s always fun to see little catches like these that I and many others overlook. Thanks! I’m just going to sum up what I wrote before and lost. I love your enthusiasm but I think there is an overuse of exclamation points. Paragraph 1, sentence 2 is way too long. You can end at the word motivation w/o losi g any effect or meaning. I’m not sure if this is the feedback that you are looking for or whether you just want us to check for typographical errors. Adina, this is exactly the type of feedback I’m looking for! Your insight is very helpful to me and will make this book much better than it would have been without them. As you suggested, I have rewritten those paragraphs and removed most of the exclamation marks.